To celebrate the 35th anniversary of Steven Spielberg’s E.T. : The Extra-Terrestrial, conductor Keith Lockhart and the Boston Pops accompanied the movie performing the score in its entirety last night (repeating this afternoon), with some additional material composed for live performance. Reviewing a film score is different from reviewing a conventional concert. The music has to react to what is onscreen yet at the same time preempt aspects of characters’ emotional states, allude to motive, function mid-scene, and juxtapose multiple trains of thought. It is not concert music; independent of the scenes they accompany, film scores on their own lack a key element for comprehension. That is what makes the Pops ventures so engaging: score performance accompanying the film fills in gaps for the audience to understand musical points. The Pops does these a few times a season, often involving work by by conductor laureate the composer John Williams. The E.T. additions included music closing the first half of the concert (the movie was split in two in order to give the musicians a break) and what could be described as entr’acte material derived from major themes to resume the film viewing. 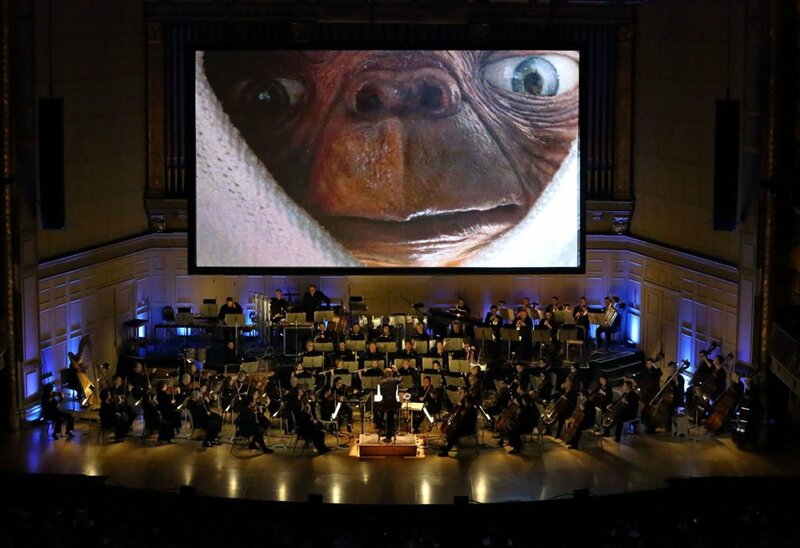 Even if this event was directed popularly, at those interested in seeing the movie again, the musical performance remained at an extremely high, BSO level. Williams’s scores are complicated assortments of iterations of multiple themes that have to line up with the image on screen in order to make sense in a linear timeframe. Given Williams’s style, there were around three major motifs that ran through the score. A bassoon-dominated motif plays when government agents are investigating the alien (the “Keys” theme), a far more orchestrationally amorphous line that transmutes through high winds (piccolo) and high strings for the aliens (the “Alien” theme), and the famous string melody that has come to define the score thanks to the flying bike in front of the moon that plays when Elliot and E.T. share their connection (the “Connection” theme). Despite being composed of relatively short melodic fragments, mixed in with other material, the score overall exceeds expectations for communicating necessary information for the film. That said, there are a few moments where the music falters compositionally. Near the end is a long sequence where the neighborhood children are chased by the federal authorities and local police. Out of style for Williams, there is not much in the way of major material to latch onto. What’s there is solid scoring but feels slightly generic and lacks the last layer of polish that would make it unmistakably John Williams. The orchestration is worth noting. The majority of the textures are carried by the strings, echoing Wagner in how strings in isolation play chorale textures. As mentioned, the “Keys” theme is associated with the bassoons, played by Richard Ranti and Suzanne Nelsen. These instruments permeated the otherwise rich texture of strings supported mostly by the nondouble-reed instruments like flute and clarinet, creating a clearly defined break between melody and accompaniment. Frequently, when Williams wants to clarify a melodic idea in the orchestra, he places it in the French horns, and the score to E.T. is no exception. Many times Richard Sebring, Rachel Childers, Michael Winter, Jason Snider, and Jonathan Menkis were called upon to extract a line from the string texture. The textures do have one major reliance, though. The harp, played masterfully by Jessica Zhou, frequented many of the cues, either by accenting the entrances of other instruments like the aforementioned horns or blended in with strings, clarinets, and oboes, or by playing glissandos by itself to create a mystical atmosphere. Could it be said that the score relies on the harp as a crutch? Possibly, at the very least it is highly effective and helps make the sonic profile. The style of performance required for a live score-to-film session requires unique elements from the conductor. Lockhart did not displease. In between watching the movie, from the position I was sitting in, I could catch glimpses of the computer monitor on his podium, which played the material in tandem with what was being projected on the large screen the audience was paying attention to. A variety of streamers (scrolling white lines that give a conductor or composer lead time to a major event, or “hit,” in a specific frame) and punches (white circles that flash on screen during a hit the streamer was leading to) peppered his view, which allowed him to maintain relative synch with the film, despite doing what’s known in the business as “free-handing” the conducting (John Williams is notorious for free-handing, which can result in some of his hits not lining up with what is onscreen). Lockhart’s accuracy of event timing must be commended. What he is doing is not easy, and that he is doing it to the level he is means he’s deeply gifted in the art of conducting to film. There were also, unusually, a series of colored streamers that gave him information, such as a green streamer leading to a point where the music should start and an orange streamer warning before a major entrance or tempo change. It was fascinating to watch, especially considering I conducted scoring sessions myself a few years ago; it is extremely atypical to perform a score linearly as Lockhart does. Also interesting to note is that Lockhart through the concert conducted from a stool. Conductors tend to make this choice when they want to not be the center of attention in the ensemble, in effect giving way to something they consider more important. It was a good choice; the audience could pay attention more easily. Indeed, that might be the best way to describe this event: orchestra remained subservient to film. The audience engaged with the material, reacting more to the images onscreen in the moment and treating the orchestra as part of the finished product. John Williams got an applause in the very beginning when his credit scrolled by, and for good reason. His impact on film scoring, and classical music in general, has made people who would otherwise be little interested in orchestras go to a performance (with the added visual draw of a film, plus projected lights during intermission). Given this quality of outcome, no one would argue with the intention. The audience greatly enjoyed the experience, and in the end isn’t that what’s important? Composer and tubist Ian Wiese, a graduate student in music composition at the New England Conservatory is currently a student of concert organizer Julia Werntz as well as of Kati Agocs.